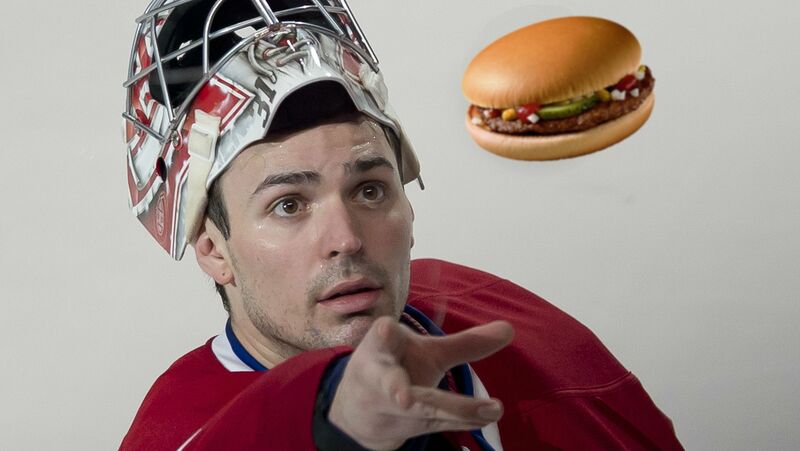 Posted on April 14, 2015 by Luke P.
“A burger appeared to me in a dream last night.”, explains Carey Price as his teammates start to visibly lose interest in the story.
.@Senators are 1st team in NHL history to qualify for playoffs after sitting 14 PTS outside the postseason picture (at any point in season). At first glance, that stat might seem a little surprising. After all, the NHL has been around for quite a few years and 14 points is only 7 wins. #Actually, 14 points might as well be from here to Mars. 14 points was the difference between playoffs in the Western Conference and the 4th overall pick last year. 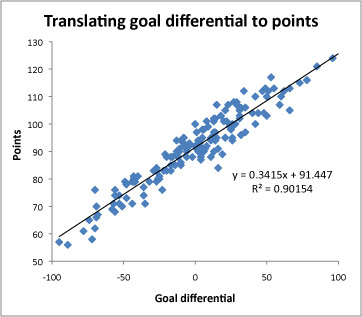 14 points is a +40 goal differential. 14 points isn’t what separates the contenders from the pretenders, it’s what separates the contenders from those who shouldn’t even bother. What’s really going to blow your mind is the fact that at the time the Senators were 14 points out of the playoffs, they were 19 points back of Pittsburgh WHO THEY EVENTUALLY PASSED. I could talk about this for hours, but I guess the takeaway is this: anything is possible when you don’t lose for two full months. Ask your doctor if winning is right for you. By far the weirdest thing about this whole “improbable run to make the playoffs” thing is the knowledge that we’ve already seen the most absurd thing the Senators are going to do this year. Where can they possibly go from here? Come back from 0-3 down to win a series? Whatever, that’s already happened 4 times in NHL history. What if they win the Cup? No big deal, someone wins the Cup every year. It’s like opening a magic act by pulling a rabbit out of a hat you’ve sawed in half while unicycling across a tightrope blindfolded: no matter how impressive it is when you pull the seven of clubs out of a volunteer’s ear later in the show, its impact is going to be slightly reduced due to what preceded it. Like it or not, you’re being graded on a curve from the moment you stick that unicycle dismount as a flock of doves flies into the rafters. With all that being said, I plan on enjoying the hell out of whatever’s next. The phrase “house money” gets thrown around a lot these days, but all that really means is that Sens fans no longer have any right to complain. And thank God for that! Frankly, complaining was the only thing we had going for us for a while. So pour yourself a Talisker, put the needle on your favourite Steely Dan vinyl (It’s Aja. Self-explanatory. ), and take a seat. I’m here to tell you everything you need to know. Some of what I’m about to tell you may veer dangerously close to “analysis”, but just hold my hand and we will get through this. Together. Clarke MacArthur and Kyle Turris have become such strong two-way 1st liners that it’s starting to raise serious questions about whether or not Randy Carlyle and Dave Tippet know what they’re talking about. But like I always say: one man’s entitled high draft pick is another man’s backbone of the team for years to come. (Related: I can haz Taylor Hall? Call me, Edmonton!) In other news, Mark Stone simply does whatever the hell he wants regardless of what the other team has to say about it. In terms of defense pairings Karlsson and Methot will drive the play, Gryba and Borowiecki will drive me to drink, and Ceci and Wiercioch will take care of the rest. Nothing new there. There have been rumblings on The Twitters that Erik Karlsson is playing hurt. Given that he hasn’t practiced in quite some time, I think it’s reasonable to assume that he’s a bit banged up, and by “banged up” I mean “still playing 30 minutes a night”. How hurt is he really? No idea1, but you gotta hear both sides. (Unlikely, given that playoff injury information is more closely guarded than nuclear launch codes.) On the other hand, the last time Ottawa played Montreal in the playoffs EK absolutely ran show against the Habs (5GP, 6P, +5) on one leg. This time around, I’m going to say Karlsson’s going to be in even better shape on account of not having had surgery in the past two months. Much could be made of Ottawa’s decision to continue to start rookie Andrew Hammond, but I can’t say I’m that worried about it. Hammond’s already been starting some big games over the past 2 months, and the pressure has formed him into a giant burger shaped diamond. Even if he finally crashes back to earth, the Sens will turn to Veteran Good Goaltender Craig Anderson, and that will be that. Also, Robin Lehner is a goaltending prospect with the Ottawa Senators organization. Ok, enough about the Ottawa Senators. What about the team about which I don’t know what I’m talking? Hot take: Some of the players on the Montreal Canadiens are good. Max Pacioretty gets a lot of shots, a lot of goals, and a lot of points. P.K. Subban and Andrei Markov combined for 110 points this year. Brendan Gallagher put up 47 points this year, has been Montreal’s best possession forward since December, and he’s only 22. 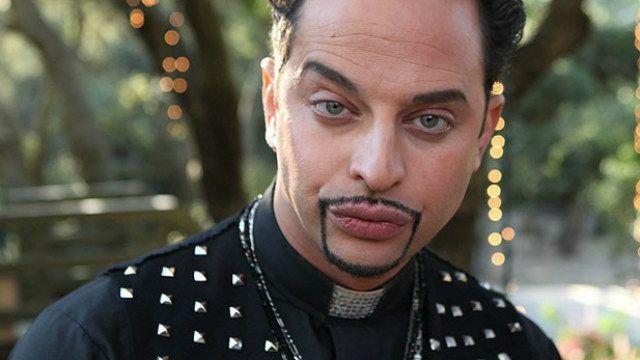 Tomas Plekanec looks like Bobby Bottleservice. Carey Price has been en fuego for the past two seasons, will certainly win the Vezina Trophy this year, and should probably win the Hart. I think Ottawa’s going to have their hands full with Montreal’s top 6 and the Subban-Markov pairing, just has been the case for everyone else all year. Luckily, the rest of Montreal’s team borders on disappointing. Jeff Petry and Alexei Emelin have been getting crushed during 5-on-5 play. PA Parenteau and Devante Smith-Pelly were supposed to be the missing pieces that pushed the Habs over the top, but they can’t even touch David Legwand or Chris Neil numbers. Speaking of “David Legwand numbers”, guess what Lars Eller has! 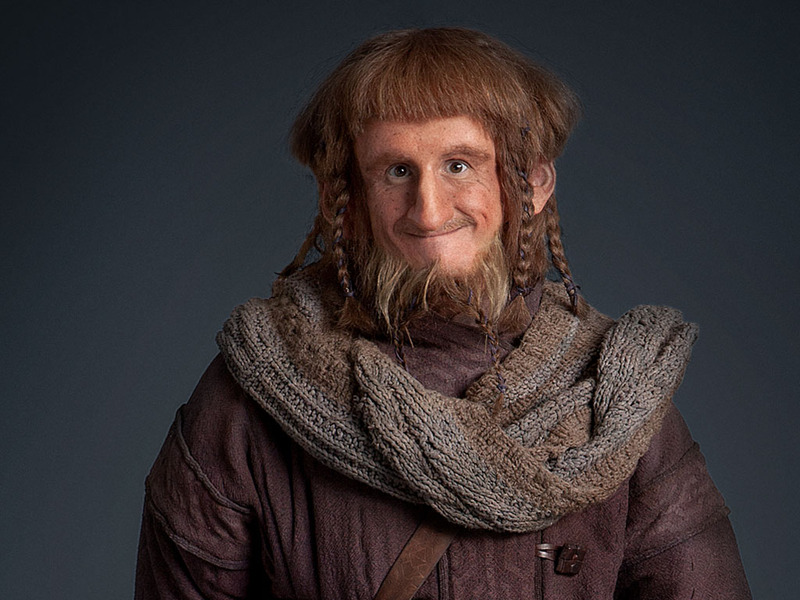 Dale Weise is tied for 4th on the team with a +/- of +21, but is rocking a cool 105.3% PDO and also looks like Ori from The Hobbit. Once you get past Montreal’s top 8 or 9 players, there’s a long list of guys that make you go “Oh, we can definitely beat THOSE guys”. Speaking of segues, did you know Sergei Gonchar is on Montreal now? If you hold your ear up to his contract, you can hear The Circle of Life playing. 1. The Ottawa Senators have spent the 2nd least amount of time down 2 or more goals in this year. 2. Montreal’s had one of the better penalty kills since Paul Maclean was fired. 3. Brendan Gallagher and Dale Weise have the best penalty differential on the Montreal Canadiens which is SO ANNOYING BECAUSE I HATE THEM AND THEIR DUMB FACES. 4. Carey Price hasn’t been great against Ottawa recently. 5. Ottawa had 1093 PIMs in 2013-14, but only 841 PIMs in 2014-15. That’s four games worth of time Ottawa didn’t spend in the box this year. Ottawa’s depth is their biggest advantage in this series and there are lots of ways for Dave Cameron to exploit this fact. He could sacrifice Lazar-Condra-Pageau to the Habs’ top line to free up other matchups, or he could just roll 4 lines and dare Michel Therrien to try to keep up. Either way, I don’t expect Montreal to dominate play for long stretches of time. The wild card here is, of course, Carey Price. Now I realize I just spent 1700 words to get to the revolutionary analysis of “goaltending is important”, but seriously: if Carey Price stands on his head, it won’t matter how bad Bryan Flynn is. In fact, that’s how we got here to begin with. The good news is that even if Carey Price does Carey Price things, I don’t expect the Senators to panic. The one lesson they’ve learned over the past two months is that when they trust the system, good things happen. They’ve won every which way to get into the playoffs. They’ve won from 3 goals behind, they’ve won in a shootout from 4 goals ahead, they’ve gone on the road and played “perfect road games”, and they’ve blown out teams at home. They’ve seen it all, and I don’t expect them to panic just because someone tells them that now the games matter even more. Winning tends to instill confidence, and this is a good time of year to be confident. Prediction: Sens in 6. Carey Price is a goalie, not a miracle worker. Get at me, haters!